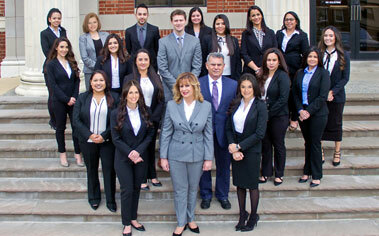 Labrada Dumé & Associates is a reputable boutique law firm that practices Immigration and Family Law. Our knowledgeable, trustworthy and effective attorneys are highly-qualified and dedicated to providing the strongest possible legal representation. They are also approachable and compassionate. Our renowned immigration practice is global in scope. Although our attorneys appear most regularly in the immigration courts and USCIS offices in New Jersey and New York, our firm has an array of international clients that we represent throughout the United States and at U.S. consulates worldwide. In our globalized practice, distance is never a barrier. Our attorneys travel extensively in order to accommodate clients' needs. We represent individuals and corporations in all areas of immigration law including Fiancé Visas, Family-based Immigrant Visas, Employment-based Nonimmigrant and Immigrant Visas, Adjustment of Status, Naturalization, Visas for Aliens of Extraordinary Ability, Asylum, Cancellation of Removal, U Visas, Deferred Action for Childhood Arrivals (DACA) and I-601 A waivers. Our firm offers emergent legal services to individuals detained by ICE in removal and Bond proceedings nationwide. We regularly help detainees get released from ICE detention on bond, parole or on an Order of Supervision. Our attorneys are experienced in filing Motions to Reopen removal and deportation proceedings. Getting an immigration case granted greatly depends on how petitions, applications and motions are presented and supported by personal documentation. Such evidence must address the requirements of each particular case. Our experienced attorneys and high-skilled staff can provide the exceptional presentation your immigration case needs to get approved. We have achieved success in thousands of immigration cases. In fact, our practice has grown primarily through referrals from satisfied clients. Our well-respected Family Law practice focuses on Divorce, Child Custody and Domestic Violence cases. We represent individuals in Family Law matters throughout the state of New Jersey. Our personalized, compassionate but vigorous representation enables us to provide effective results in what can be a sensitive area of law. The outcome of family law matters can affect whether you live with your children, how your assets are divided or whether you receive protection from someone you fear. In cases where personal stakes can be so high, our attorneys will attempt to negotiate a solution that works best for the parties but are prepared to litigate aggressively in order to protect our client's interests. Our firm boasts a close-knit teamwork that has made us a family that we hope you will join. Through our dedication, perseverance and proven track record, we have earned acclaim for success. We invite you to become a part of our success story. Jillian Mariel Dumé is an attorney and the managing partner of the New York office. Ms. Dumé is a graduate of the University of Pennsylvania where she earned a Bachelor's Degree in Political Science with a minor in French Studies. Ms. Dumé received a Juris Doctor degree from the University of Miami School of Law. Ms. Dumé is admitted to the New York and New Jersey Bars.